The CME (Chicago Mercantile Exchange) and CBOE (Chicago Board Options Exchange) have long been ‘rivals’. CME was the first of the two largest derivatives markets to announce a futures contract, but it appears the CBOE will be the first to actively launch it. The CBOE announced it is going to start trading Bitcoin futures on December 10th. 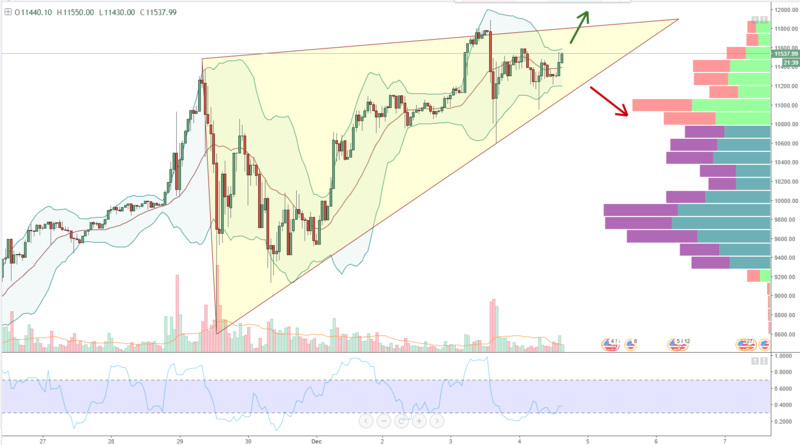 How will this affect the BTCUSD trade? The trade over the weekend was mostly flat, until Sunday morning when we had a big move from 11130 to 11546.99. We then reached an all-time high, again, at 11584.08. What has been interesting is that we are trading in much narrower price ranges. We are still trending up, but it appears we are entering a consolidation area. There are more sellers entering the market according to the volume profile, so this may just be a distribution zone before the next move up. The trade on Bitcoin is continuing it’s trend of dip and buy. This triangle a drew should provide some nice momentum depending where price shoots out. There is no reason for price to not continue to move up and touch the 12000 area. We are, according to the hourly, in the very beginning of a Bollinger squeeze. For a long position, we do have some fair conditions. Because we have entered a Bollinger Band squeeze, and the DeMark Indicator is right above the oversold area, we could observe an explosive move to the upside. This is the most probable scenario. Extreme oversold on the oscillator. A false break above towards the upper Bollinger Band line with those oversold levels. Heavy volume on both VPA and VAP. There was not a lot of explosive buying on the announcement that the CBOE would start trading the Bitcoin futures contract on the 10th. When those kinds of big scenarios happen in any market, with any preplanned major news, it is not uncommon for that instrument to range trade until the event starts. We also need to observe the behavior of the entire cryptocurrency market as a whole, especially how they will respond at 6 PM Sunday (when the Bitcoin contract will officially start trading).